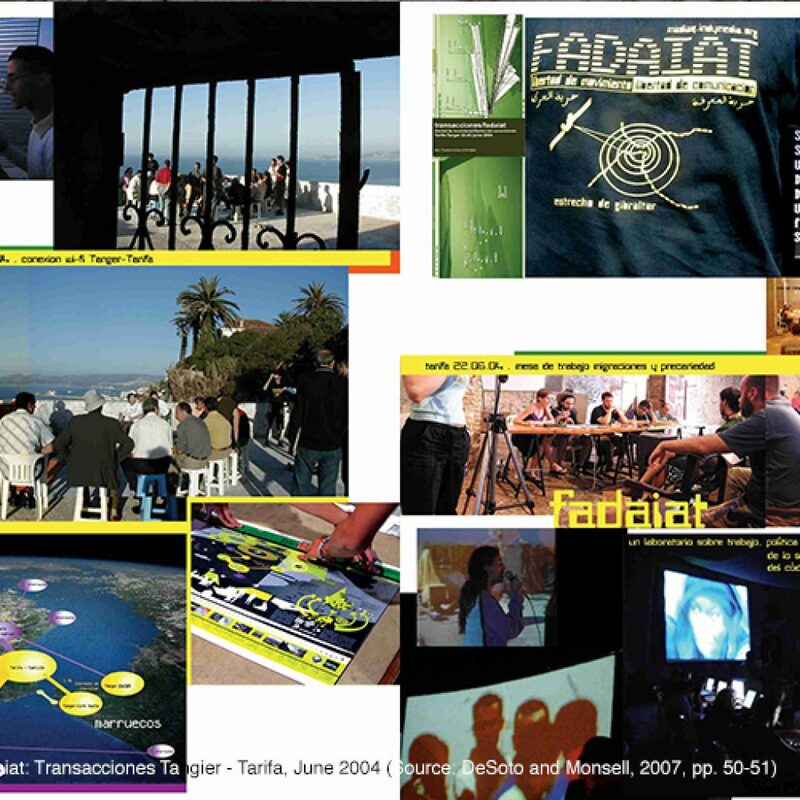 On June 2004, during the Fadaiat activist-art event, a transcontinental Wi-Fi connection was established between the Castle of Guzman el Bueno in Tarifa (Spain) and the Cafè Hafa in Tangier (Morocco), across the 32 kilometres separating the two shores of the Strait of Gibraltar (1). During the two day-event, a community of hacktivists, artists, and human right activists gathered to discuss and elaborate new imaginaries on the border, while activating a workshop for social, political, and artistic experimentation whose outcomes reached out to other geographies and other networks in the following years. 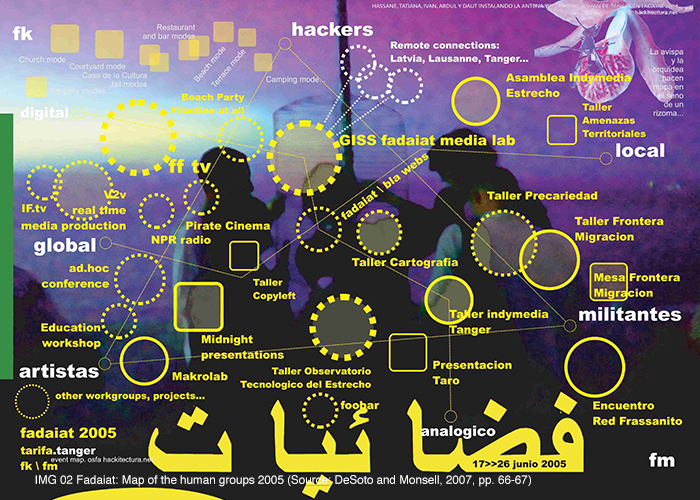 More than a decade after this inspiring, socio-cultural, imaginative experiment at the EU-North African border, Pablo DeSoto – architect, researcher, hacktivist, co-founder of hackitectura.net and among the key protagonists of Fadaiat – retraces his artistic and activist research from Fadaiat, and the legacy of the early 2000s cultural production on the Strait of Gibraltar, to the artistic and social practices emerging after the Fukushima nuclear disaster (2). How would you explain, from your perspective, the genealogy and trajectory of Fadaiat in the context of the early 2000s debate on European borders and the season of cultural and political production on the Spanish-Moroccan border? Fadaiat is the result of the encounter and creation of a peculiar network across the geopolitical territory of the Strait of Gibraltar, an extraordinary space of flows between the Mediterranean Sea and the Atlantic Ocean, Europe and Africa, defined by different systems converging and collapsing; a space we considered ours. The genealogy of the project is related to a particular moment at the early 2000s when there was a fruitful convergence between, on one side, movements for the autonomy of the media, and on the other, movements concerned with issues about migration. The innovative dimension of the project is linked to its capacity to gather those two social changes while generating a series of compelling actions both in the ‘digital territory’ and ‘physical territory’ of the border. That is the first radical and original feature of Fadaiat. The development of the project consisted of different stages. The first step was the founding of an Indymedia network node focusing on the Strait of Gibraltar. At the time, this happened in the emerging context of grassroots independent information media initiatives across the world converging in the main international Indymedia platform and rooted in the hacker and free software movement, People’s Global Action, the Zapatista uprising, the protests against neoliberal globalisation in Seattle, and much more. In this prolific context, the idea to initiate an Indymedia node focusing on the Strait was an attempt to move beyond national-state boundaries towards a more significant geopolitical territory represented by the Strait. It was a big change concerning social imagination: to situate our ‘theatre of operations’ and activism in the territory of the Strait based on both ‘poetical’ and political terms. It was the understanding of the border as a centre; we were becoming trans-border bodies. This driving notion captured the imagination of different people who started to work together, digitally and physically, through theoretical and active practices. We were a bunch of people with different backgrounds who got together thanks to a common interest in hacktivism and activism concerning migrations issues. This community started to work as a grassroot-organized network, working from the orbit of ‘self-managed social centres’ (in Malaga and Seville) and hacktivist spaces. The first objective of our network was to provide coverage and assistance to those activists who were helping migrants at the border and to the independent journalists who were writing stories about those events. Hence, Indymedia Straits was set up in 2003, and from the beginning, there were nodes in the two continents. The most active nodes were on the northern shore of the Strait, in Andalusia, while smaller though interconnected ones were located in Morocco. At hackitectura.net (3) we, as Deleuzian-Guattarian architects ourselves, added mapmaking to the cocktail, starting an ambitious cartographic project. The second step was the organisation of a ‘gathering’ which would link both shores of the Strait simultaneously. Hackitectura approached it as an experimental architectural project functioning as a temporary bridge across the border under the name of Fadaiat (through spaces) and the slogan ‘Freedom of movement. Freedom of knowledge’. Fadaiat was a metaphor, a multimorphic challenge, a call to join numerous skilful activists. On a political level, it synthesised the two already-mentioned practices: hacktivism (free software and independent media movements) and migrant rights movements (self-determination of mobility against the enclosures imposed by the ‘Fortress Europe’). The main core group included around forty people who shared a special ‘chemistry’: we were all struggling against the juridical and physical devices produced by EU policies, mainly through ideas and imaginary, but also deploying actions in the physical territory, as the ones against the CIEs (temporary detention centres for migrants). CIEs and the SIVE (Sistema Integral de Vigilancia Exterior) were critical infrastructures of the low-intensity ‘war’ against migrants – mainly sub-Saharan Africans – located at the Strait. The SIVE was back then a brand-new surveillance system able to track down migrants on small boats before reaching the Spanish coasts, where they could have requested the status of the refugee. Therefore, the SIVE works as an immaterial ‘wall’, an electronic border. I guess the project emerged out of a sense of historical responsibility at a time when the border was being ‘prototyped’ through control devices aimed at building the EU fortress. We imagined Fadaiat as a kind of ‘reflecting mirror’ opposed to those border devices; a reverse engineering of SIVE. We were fighting on the frontline with an experiment that put together architecture, digital technology, free software, journalism, art, and telecommunications. Our device/event/gathering not only gave us the opportunity to meet, talk and exchange ideas, but also to experiment technology at the border. During the first Fadaiat, we set up a temporary wireless connection between two computers on both sides of the Strait – 32 kilometres between Tarifa and Tangier. In 2004, Wi-Fi technology was not available as today, so it seemed almost as a kind of ‘science fiction’ action. It worked both in a symbolic and practical way as we managed to broadcast a video-conference! This mix of grassroots, high-tech experimentation and classic activism was unique of Fadaiat. All these energies and amazing people produced a very special moment which is quite difficult to repeat and reproduce. It opened a space of social imagination about the border. Indeed, by many of us Fadaiat was perceived as a mind-changing experience. For some people it became a contemporary myth, opening the field of ‘the possible’ or ‘the impossible’, imagining another world at the border. This is Fadaiat’s main legacy. Later, we took part in a competition to establish a permanent base, in a small castle in Tarifa, entitled Technological Observatory of the Strait (Observatorio Tecnológico del Estrecho). Unfortunately, we did not get it. We succeeded instead in publishing a wonderful book about the whole experience. We wanted to collect all the future imaginaries Fadaiat had generated. The book Fadaiat: Libertad de Movimiento, Libertad de Conocimiento(by DeSoto and Monsell) was published in 2007. Many people took part in the production. Partially translated into English and Arabic, it has the role to keep the project’s visions and achievements alive and to inspire other activists, social scientists, troublemakers, and border hackers. More than ten years after, in the midst of the numerous current refugee crises, the political issues raised by Fadaiat are even more urgent and compelling. How did you develop the process of mapping and drawing the cartographies for Fadaiat and the book? How would you describe your ‘collaborative approach’? What were the stages of this process? The process took almost two years and involved different methodologies. The fieldwork was coordinated by José Perez de Lama with the collaboration of many contributors from both shores of the Strait. Several working sessions were held in different cities across Andalusia, and in Alhucemas and Tangiers in Morocco. It was a very dynamic and stimulating process. We used our digital infrastructures: the Indymedia Straits mailing list for coordination and the hackitectura wiki for online writing and file sharing. We prepared several drafts that were given to qualified contributors to be commented. Then, for over a month, we put together all the feedbacks and integrated them in the final designs. The map was drawn giving special attention to its communicative aspect. We sought to produce a ‘counter-hegemonic’ and ‘rebel’ visual aesthetics; to turn a map into a ‘magnetic’ artwork. The theoretical approach was mainly based on Negri and Hardt’s political philosophy described in Empire(2000) and Multitude(2004). We were also influenced by other authors such as Naomi Klein, Hakim Bey, Sandro Mezzadra, and of course, Gilles Deleuze and Félix Guattari. The ‘A’ side of the map was outlining Empire. What do Empire and its neoliberal globalisation look like in this geopolitical territory at the beginning of the 21st century? We mapped north-south economic flows, free trade zones, new control infrastructures, detention centres, and migrant pathways. The aim was to visualize the ongoing low-intensity war against sub-Saharan migrants but also the Strait as a ‘contested’ space where ‘another world’ is possible. Hence, the ‘B’ side of the map was the most challenging one (4). 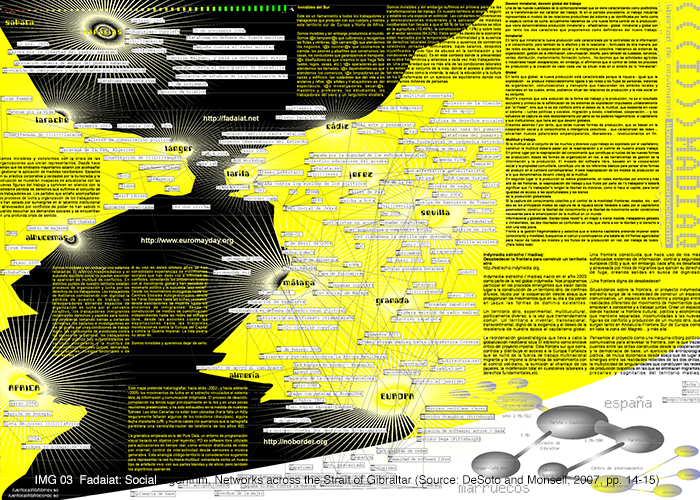 The idea was to map the ‘multitude’, the counter-hegemonic actions and groups opposing Empire: to visualise recent struggles and our emerging ‘rhizomatic’ network. We decided to use the map as a strategic tool: contents related to ‘the multitude’ were about the past, the present and the future. The map was published in 2004: and it included events that took place in 2003 as well as future ones that would happen in 2005. The latter made the map an activist political agenda for the months and years to come. 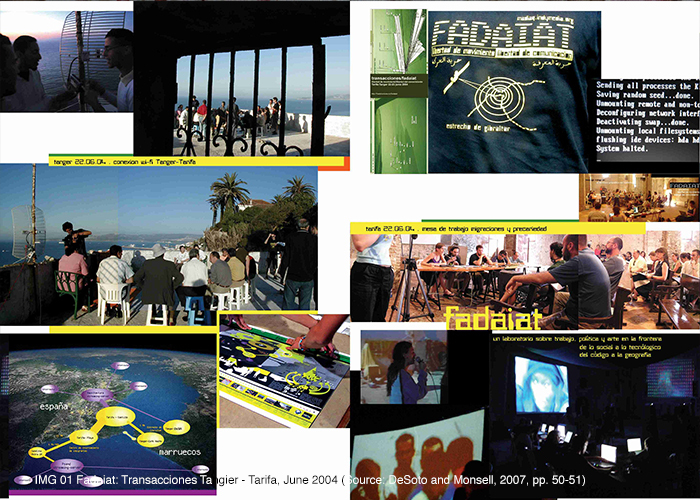 Therefore, the result was not a static map, but a map for action, a performative tool that would enhance connections among groups active at the time across Andalusia and northern Morocco. We used the metaphor of the ‘social algorithm’: a lively diagram whose lines emerged from everyday ‘face-to-face’ encounters and entanglements. Surprisingly, the map worked out well as it helped to expand and strengthen those connections. For instance, it established connections between Moroccan and Spanish networks and collectives working in different cities in Andalusia. And it had a contagious effect. The map helped to synchronise minds and bodies, solidarity and intelligence, spaces and actions. This is the map’s most significant contribution: we outlined a possible future which the map itself contributed to turning into reality, because, as we have learned from Deleuze and Guattari, maps are not just representations of reality but produce reality itself. What kind of relationships, networks, and collaborations did Fadaiat develop with other international collectives, groups, research or artistic experiences on different borderlands in those years? There were many fruitful collaborations across time and space. The first connection was established early on with the Borderhack Festival in Tijuana (2000–2001) at the Mexico-US border. This experience was a direct influence on us. It brought together migration activists, urban youth movements, cyber/net culture practitioners, and the Zapatista movement who built a ‘temporary autonomous zone’, a ‘camp’ along the border. We also established a strong relationship with the European No Border network as they were organising campaigns such as ‘No one is illegal’ (5) and the No Border camps, (6) which had a direct influence on us. With them, we organised the second edition of Fadaiat. We also established connections with groups on the eastern and north-eastern European borders, in Latvia and Serbia. At the time, some groups were involved in innovative projects based on a do-it-your-own-geopolitics perspective. A pair of amazing initiatives in Latvia were recovering technological ruins of Cold War military facilities and transforming them into experimental art and social equipment. A big surveillance satellite antenna (7) had been temporarily turned into an experimental acoustic workshop. Karosta, a former secret Soviet marine base, which was abandoned after Latvia’s independence, was turned into a lively cultural centre. These were the projects we were interested in and of which we wanted to become a partner, because they were outstanding examples of geopolitical experimentation across old and new borders. As a matter of fact, one of the aims of the Fadaiat project was to activate a larger network among three different European Borderlands: the Balkans, Russia, and Morocco. In the following years, we managed to do some intense collaborations. One of your most recent projects focuses on the Fukushima Daiichi nuclear disaster in Japan, and the activist and artistic practices that emerged both locally and internationally in response to the ‘everything is under control’ narrative implemented by the Japanese Big Industry and the authorities in the aftermath of the nuclear meltdowns (DeSoto, 2016). How did you develop your political, ethical, and methodological approach to this project compared to your prior art and activist projects? It was quite a big change going from a collective work as hackitectura.net to a more personal endeavour, also concerning the geographical focus. From the geopolitical border conditions at the Strait of Gibraltar, I moved to an entirely different environment: Japan after a triple disaster. Now the frontier was the one which had been generated by the ionizing radiation. I also began to engage in environmental issues in a manner I had never done before. According to my past experiences, it made total sense, since as a kid, the Chernobyl disaster in 1986 had impressed me so much. Its invisible cloud drifting across Europe was a strange epiphany about how human technosphere could unexpectedly evolve. When the reactor containment buildings exploded in Fukushima Daiichi, I was shocked. And I became interested. I was given the opportunity to go to Japan thanks to the Tokyo Wonder Site artist in residence grant which I was awarded in late 2011, via HANGAR centre of artistic production in Barcelona.Hence, I could conduct a three-months fieldwork in Tokyo and other places across the Fukushima prefecture. At the time, I aimed at investigating artistic and activist responses to the nuclear crisis, exploring the ways local communities and radical practitioners were facing a twofold invisibility: radioactive and institutional invisibility, the ‘everything is under control’ official narrative. It was an incredibly fruitful period in many aspects. My former experience in the Straits and other projects I had done in Palestine, Egypt, Greece were fundamental. I arrived to Japan well-trained and therefore, I was able to perform an intense fieldwork. I accomplished a level of confidence and empathy with the Japanese activists and artists, who like me before in a borderscape conflict, were experiencing a process of ‘radicalization’ in front of a contingent event. Their activist and artistic practices had changed or, in other cases, they had become artists and activists because of and as a response to the nuclear catastrophe. There was something very deep and compelling in that context, as the ‘exploded consciousness’ that Svetlana Alexievich describes in Voices of Chernobyl (2006). I guess I was able to recognise it and interact properly thanks to my previous practice and my long-standing interest in the topic. Thus, my former political, ethical, and activist experience was crucial to address this new issue with its own specific circumstances. My training as an architect working with cartography was also very helpful. My fieldwork experience was so worthwhile, and the trouble in Fukushima so significant in my understanding, that later I decided to use it for my Ph.D. thesis. I tackled such a challenge with a strong sense of responsibility and coherence towards my former political and activist practices (8). I also wanted to continue the same level of graphic outcomes though I must admit that it has been quite complicated. I lived a conflict between the desire of radical experimentation and the need to adapt to academic requirements and formats which belonged more to the 19th century than the 21st, such as delivering a written dissertation of 220 pages. I tried to be as creative as possible in spite of those constraints and tried to cope with academic writing in a radical manner – both regarding form and content. My dissertation and research method that I call SF Atlas are the results of such commitment. From the Critical Cartography of the Straits to the SF Atlas. Would you please explain the meaning of this atlas in your practice concerning the maps produced for Fadaiat? 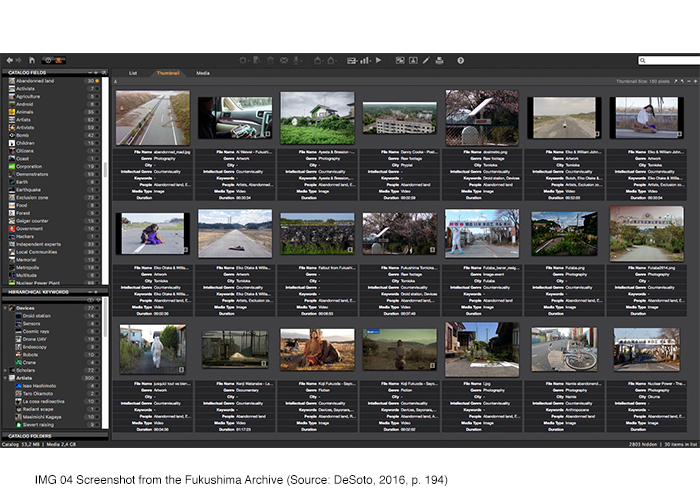 How do the SF Atlas and the Fukushima Archive work in epistemological and methodological terms? The SF Atlas SF partakes with the Critical Cartography of the Straits a desire of experimenting ways of learning and visualising a complex reality based on what we could define as a radical political imagination exercise. How to address research and design problems which involve multiple complexities and how to do it by combining art, activism, and science? How to create something stimulating both concerning form and content? How to draw something that can be a ‘pointbreak’ in the perception of a specific event? How to capture the imagination of activists, social scientist, and other radical practitioners working on the frontlines of a conflict? For the Strait, we did a very rigorous work on how the border worked from an economic and social perspective, while regarding visualisation, we used cartography as a powerful artistic and political object. We asked ourselves what other maps, what other territories could be imagined and produced (instead of the ‘Fortress Europe’ or a North-South economic system, etc.). Hence, we imagined it and drew it. In the context of the Fukushima nuclear disaster, I first asked myself how I could produce a meaningful representation of such a large, dramatic event that was so difficult to grasp, an event that had produced, borrowing Gunther Anders’ words, ‘a cognitive paralysis’ (Anders, 1986). There were so many elements to take into account. When approaching such an abstract and dangerous world produced by a nuclear crisis, one needs updated epistemological tools. My first and most obvious intuition was the need to address the object of study from as many sources as possible. 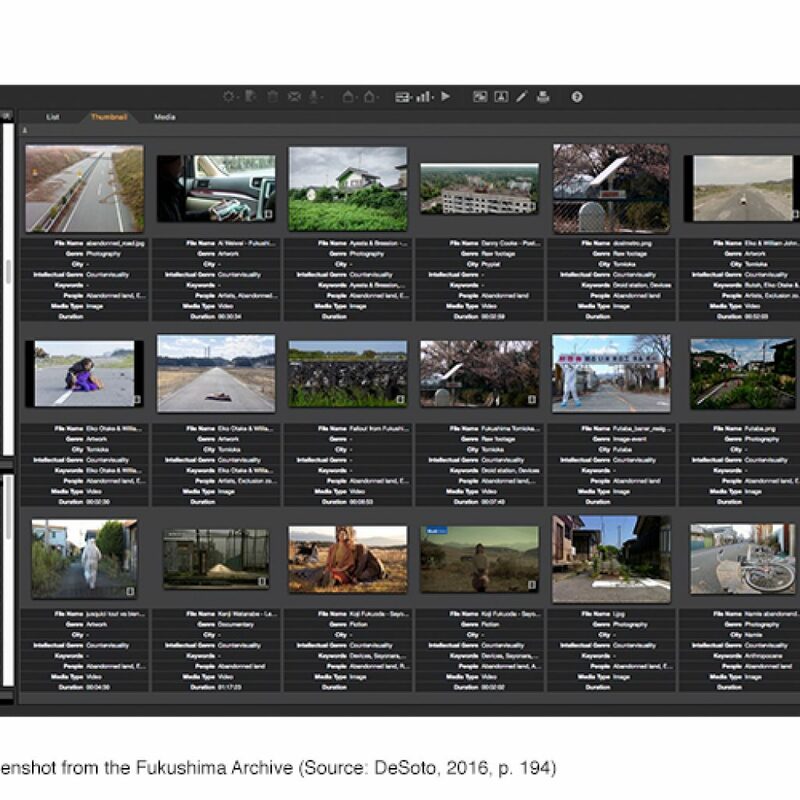 The visual dimension of the Fukushima disaster was incredibly interesting, from ‘visualising the invisible’ to the figurative exercises apprehending the Exclusion Zone. So I started to approach the object of study, not only through fieldwork and scientific literature but also creating an audio-visual archive: documentaries, fiction films, newsreels, artist videos, raw TEPCO footage, activist actions recordings, Geiger counter measurements by ordinary citizens, press conferences, etc. I collected around 900 videos and almost 2,000 pictures. To deal with so many elements, I did some research on digital asset management software to create my metadata fields. As a result, my visual information system was able to keep track of all different aspects concerning the event. This is a very powerful approach that in the late 20th century was not available. In the case of Chernobyl for example, almost no videos documented the event. Once you have created the archive, the Atlas approach is the inventive strategy that allows one to survive in such a ‘jungle’ of videos and images. It is the epistemic tool which interacts with both visual sources and abstract concepts by creating a Warburgian (9) space of thought that combines reality and imagination, primary sources and scientific studies, traditional artworks and pop culture. The Atlas allowed me to put together heterogeneous media, bridge various disciplines of knowledge, and establish relations between different dramatis personae, objects, places, and stories. From a conceptual point of view, I took as the main framework the interdisciplinary discussion about the Anthropocene and some critical formulations such as Jason W. Moore’s Capitalocene (2016) and Donna Haraway’s Chthulucene (2016). I felt there was a need to bring other ontologies and epistemologies coming from contemporary Marxist theory, eco-techno-feminism and multispecies ethnography fields. 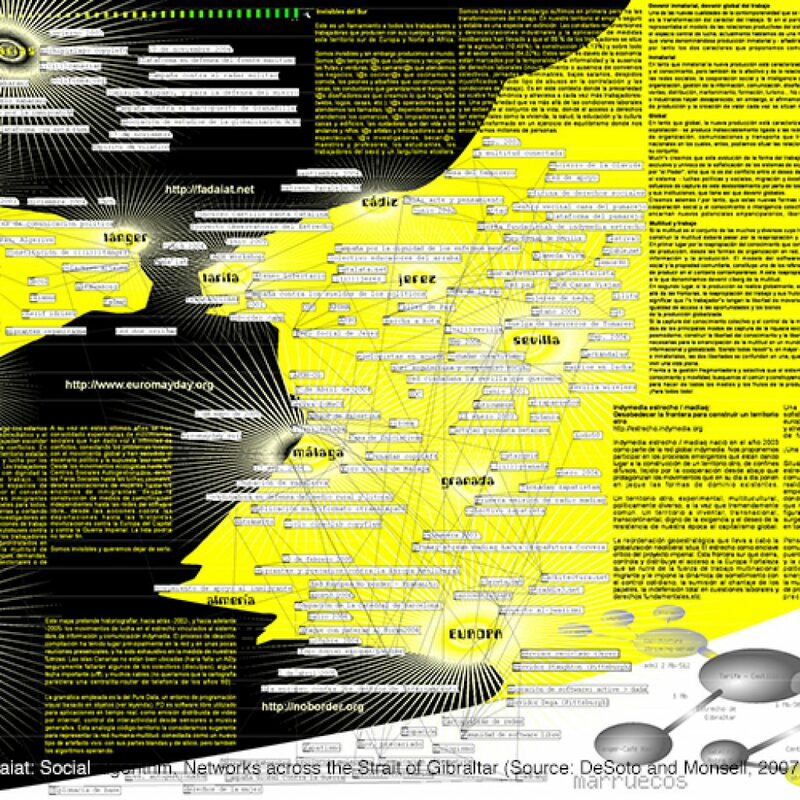 By suggesting Anthropocene, Capitalocene, and Chthulucene as analytical apparatuses and ways of investigating a nuclear catastrophe, I used the SF Atlas to create an onto-epistemology that could construct an experimental narrative about the Fukushima disaster within a current discourse on environmental challenges on a planetary scale. Thus, the SF Atlas (10) is a companion research tool. I see it as a ‘mutation’ in the way we work today with sources, attributing to videos the same relevance as texts. Does this imply that a different theory may be produced? Or, could this over-production of documental sources be counter-productive and subtract precious time for research? Can this methodology be applied to other research projects? Right now, these are open questions right now. How would you describe the role of ‘science fiction‘ in your work on Fukushima and more in general in relation to the Anthropocene narratives? The idea of science fiction in my work about Fukushima is present in two entangled matters. In Fukushima, reality became science fiction. Three nuclear reactors melted down 200 kilometres from one of the world’s most populated urban area. The evacuation order involved 160,000 people who had to escape in few minutes and leave everything behind them. Today the Exclusion Zone looks pretty much like a place where humankind is extinct; think about the movie The Last Man on Earth (1964). If one visits these sites now, the villages and the 40,000 empty buildings have become the home to plants and animals; wild boars and other animals have repopulated the area though they are radioactive contaminated. Tokyo was spared only thanks to the winds that did not blow towards the city. It took several months before the Power Plant Operator TEPCO and the Japanese authorities informed the public about the nuclear meltdowns. The legal limit for radiation exposure increased twenty times its pre-2011 value. People had a hard time figuring out what was going on in the air, the water, the food, and what a ‘hot spot’ meant. Radioactivity is very hard to grasp; one has to study it to understand it. Many young mothers turned themselves into ‘radioactivity experts’ building home labs to check their food because they did not trust official information. People started to gain deep awareness. In Japan, there are children who can explain what a becquerel is, or what micro sievert means (11). This constitutes a major material and cognitive change, both regarding physical and mental landscapes. Hence, part of Japanese civil society and some local communities developed their capacity to understand what was going on and how radiation works. New response-abilities emerged: ways to visualise radioactivity, ‘citizen science’ Geiger counters, independent media platforms, activist networks, farmers rebel actions… The artists’ responses have been incredible as well: visual artists, photographers, and filmmakers have looked into the Exclusion Zone achieving astonishing results; stories between science facts and science fiction. If reality has turned into science fiction, to address it as an object of study we need an epistemological toolkit that deals with and learns from it. As a scholar, I find it necessary to adopt epistemological tools that are experimental, because reality is completely experimental. Of course, it has always been. However, I refer to the mutation of the meaning of the relation between nature and culture after the radioactive fallout following the Fukushima Daiichi disaster. Earth turned into a one-to-one laboratory. Thus, I learned from the thinkers who have dealt with science fiction as part of their theoretical apparatuses, mainly, but not only, from Donna Haraway. I approached scholars who were critical towards hegemonic techno-science, such as Haraway, Isabelle Stengers, and Olga Kuchinskaya who wrote The Politics of Invisibility after studying Chernobyl (Kuchinskaya, 2014). In this book, the main issue is the myth of the absolute safety of nuclear energy. When hegemonic science claims that the possibility of a single nuclear reactor meltdown is one in a million years and then not one, but three reactors get into meltdown, it means that something is happening with science. Hence, I believe there is an urgent need to approach those feminist scientists since they are critical towards ‘absolute’ knowledge, towards binary thinking. This is why I think Donna Haraway and Isabelle Stengers are so relevant nowadays. In particular, when considering that nuclear energy is mostly managed by a bunch of old white men, corporate tycoons, nuclear physicists, and merchants of doubt. So I engage in feminist technoscience as a method to decode reality which has turned into science fiction. Regarding the Anthropocene as narrative, I think the Fukushima Daiichi disastrous event can be read as an advanced episode of the anthropogenic/capitalogenic changes on Earth. It becomes relevant to reflect on what kind of work the Anthropocene totalising narrative is performing concerning it. A neoliberal appropriation of the original stratigraphic concept of the Anthropocene is at stake; the narrative that environmental problems can be solved through new technologies, without changing anything else. It is the idea of the ‘technofix’ as geo-engineering the climate. This is what is being delivered in Japan as official narrative. Robots will fix the problem. Indeed, public-private entanglements are promoting a robot industry to face this kind of catastrophic events, which will be experimented in Fukushima Daiichi and later exported to other troubled areas around the world. We will see a lot of this type of narrative during the next Tokyo Olympic Games. Certainly, it is extremely important that brand-new ad hoc robots will be helping to clean the mess inside the cripple power plant in the next decades. Nevertheless, it is quite shocking that the Fukushima robot stories are better known that the ones who have as protagonists young people affected by thyroid cancer. For this reason, we need to make visible the stories coming from local communities, radical artists, and citizen scientists. Some of the Fukushima counter-hegemonic SF stories are included in my dissertation. I must say that I enjoyed a lot discovering and writing about them as I perceive them like coming from future scenarios of environmental struggles, from a world of sacrifice zones, technofixes, citizen scientists, bio-robots, and invisible radioactive clouds. Oh! But that’s already now. (2) This conversation started in 2014 and was first published in 2015 as ‘After Fadaiat: A Conversation with Pablo de Soto’ in TERRITORIO, 72/2015, pp. 117–119, DOI:10.3280/TR2015-072018. The text was edited and expanded in November 2017 for TRACES Journal. (3) Founding members of the collective are Sergio Moreno, José Pérez de Lama, and Pablo de Soto. (7) Source: http://rixc.lv/waves/en/txt32.html / www.virac.venta.lv/en (Last accessed on June 2015). (9) Aby Warburg (1866–1929) was a German art historian and cultural theorist mostly renowned for his Mnemosyne Atlas, an unfinished attempt to map the history of art through a non-chronological display of thousands of images, photos, and illustrations. Source: https://live-warburglibrarycornelledu.pantheonsite.io/about. (10) SF signifier refers to Donna Haraway’s word game: string figures, science fiction, scientific fact, speculative feminism, speculative fabulation, etc. (11) The sievert (symbol: Sv) is a derived unit of ionizing radiation dose in the International System of Units and a measure of the health effect of low levels of ionizing radiation on the human body. Alexievich, Svjatlana. 2006. Voices from Chernobyl: The Oral History of a Nuclear Disaster, trans. K. Gessen. New York: Picador. Anders, Günther. 1986. Diez tesis sobre Chernobil: Mensaje amistoso al Sexto congreso Internacional de Médicos por el impedimento de una guerra nuclear. DeSoto, Paulo. 2016. “Antropoceno, Capitaloceno, Chthuluceno, viviendo con el problema en Fukushima,” Phd Thesis, Universidade Federal de Rio de Janeiro. DeSoto, Paulo and Pilar Monsell. 2007. Fadaiat: Libertad de Movimiento, Libertad de Conocimiento. Málaga: Cedma. Haraway, Donna J. 2016. Staying with the Trouble: Making Kin in the Chthulucene. Durham: Duke University Press. Hardt, Michael and Antonio Negri. 2000. Empire. Harvard: Harvard University Press. ___. 2004. Multitude: War and Democracy in the Age of Empire. London: Penguin Books. Kuchinskaya, Olga. 2014. The Politics of Invisibility: Public Knowledge about Radiation Health Effects after Chernobyl. Cambridge, Massachusetts: The MIT Press. Moore, Jason W. 2016. Anthropocene or Capitalocene? Nature, History, and the Crisis of Capitalism. Oakland, CA: PM Press. Stengers, Isabelle. 2015. In Catastrophic Times. London, Lüneburg: Open Humanities Press/Meson Press.